The Beagleboard Foundation just came out with an extremely spiffy new Beaglebone, the Beaglebone AI. It’s an amazingly capable beast and I can’t wait to get one to fiddle with. Check it out. We now have an instagram maintained by our fearless leader, @robotsailboat. Check it out! The most serious issue with the current set of wings is that they are way too heavy, at ~ 2.4 kg each. They also have a high center of gravity — about 500 mm above the deck. As a result, we need to put over 12 kg in the keel to keep the boat upright. As a result, it sits low in the water and is much slower and less responsive than it could be. Their construction (bent plywood over laser cut plywood frames with printed ABS fittings) is also not representative of the the sort of wing we’d like to build for ocean going vessels. Eliminate the difficult wire routing from the servo to the controller. Leverage the capabilities available at The Facility Makerspace to produce a light, strong, and inexpensive wing. The construction method I selected for the wing is a laser cut plywood frame filled in with router-cut foam blocks and covered with epoxy-glass fiber composite. These choices leverage three things available at the Facility — laser cutting, the CNC router, and the composites lab. They can also be scaled up for the wings for the Microstransat boat, which are twice as large in every dimension. This design is a kilogram lighter than what it replaces with a center of gravity a full 200mm lower, on a wing that’s only 1000 mm tall in the first place. Additionally, the box support for the tail mounting provides a convenient place to mount the electronics with no twisty passages for the wiring to snake through. It also makes it easy to make a fitted hatch cover for electronics access. It does put the servo off center a little bit, but I don’t think that will be significant in the final analysis. 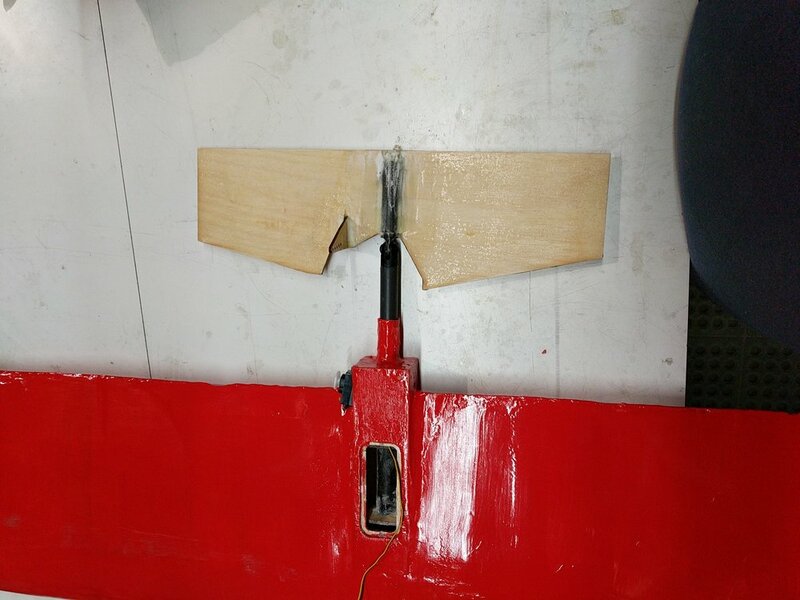 Initial calculations show that removing a kilo from each wing while lowering the CG by 200 mm will allow us to remove 6 kg from the keel, for a total weight loss of 8 kg. The boat only weighs 21 kg in the current configuration, so this is a major reduction in weight; I look forward to a corresponding improvement in speed and responsiveness on the water. The tail attachment is simple — a pultruded carbon tube is fixed into the structure, and a smaller tube slides neatly into it. A stainless steel bolt match drilled in Dragonscale makes both the tubes and a line of bonded-in fittings for them that allow me to create a convenient hinge for the tail. The spine of the tail is another piece of carbon tube glassed into the laser cut plywood that forms the blade of the tail. Like the last iteration of the wings, the counterweight is a stack of fender washers on a piece of 3/8” all-thread. The all-thread is passed through the main spar and both bolted and glassed in for extra strength. The following gallery contains a visual history of the assembly and painting of the wings. Click on the images to expand and see a description for each one. Lasercut parts for the frame laid out prior to assembly. Assembled frame with mast pivots installed. Mast pivot installation. The mounting block for the counterweight is present but has not yet been drilled. Wing frame with the foam blocks partially assembled. Wing frames and cores assembled, sanded, and ready for glass. Note the counterweight boom in the lower left. Wing with fiberglass tacked on, ready for resin. 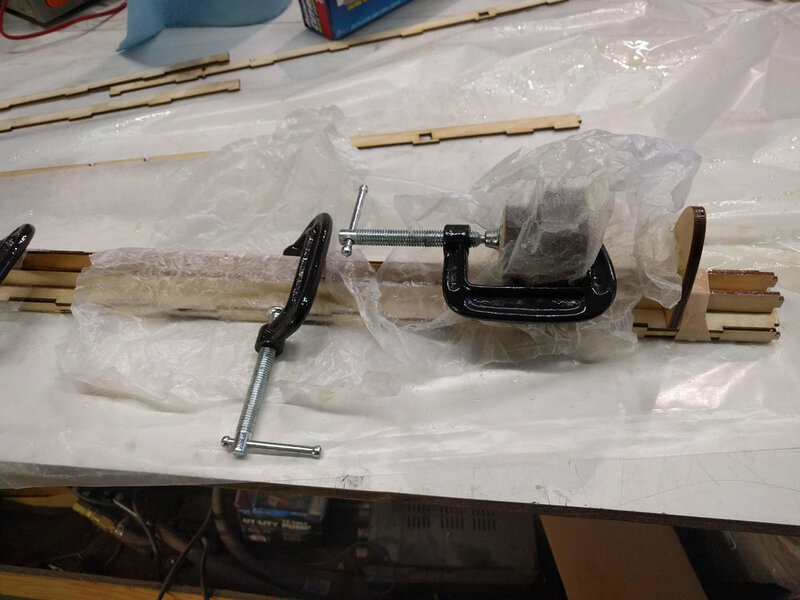 Wing vacuum-bagged while the resin cures. Wings completed and primed, ready for paint. New wings, test fit on the boat with the Hackerbot Labs Rawrbot in the background. Detail of the assembled tail. Still needs to retaining/alignment bolt. First, we're at Seattle Mini MakerFaire (https://www.facebook.com/events/215651449157117/?event_time_id=215651455823783) this weekend, in Maker Alley! If you're there, please come by and say hi! 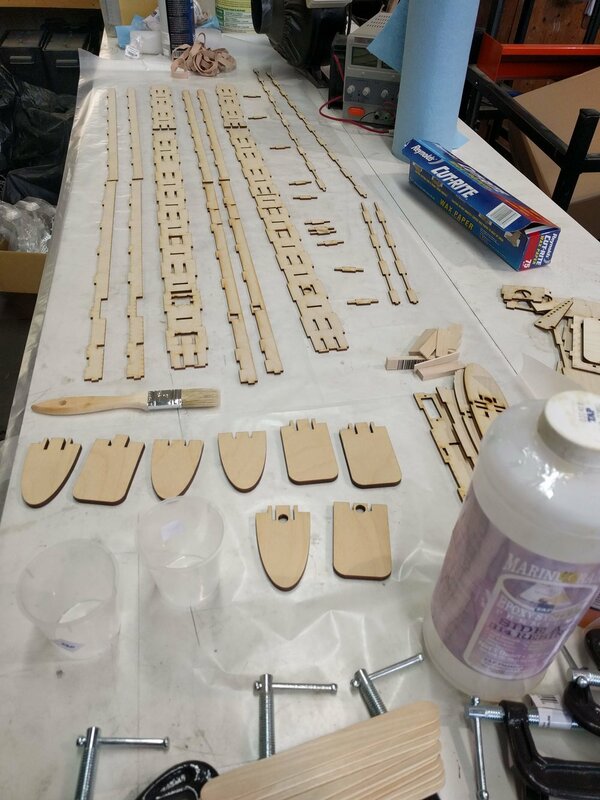 On the hardware front, we've gotten the wing molds fabricated and will shortly begin pulling some test parts. We've also put together a full set of cut files for the hull of the Microtransat boat. We also added compasses to the wing sails in order to allow us to estimate the wind direction without additional hardware. This simplifies the boat and removes one more system (wind vanes) from the critical path. 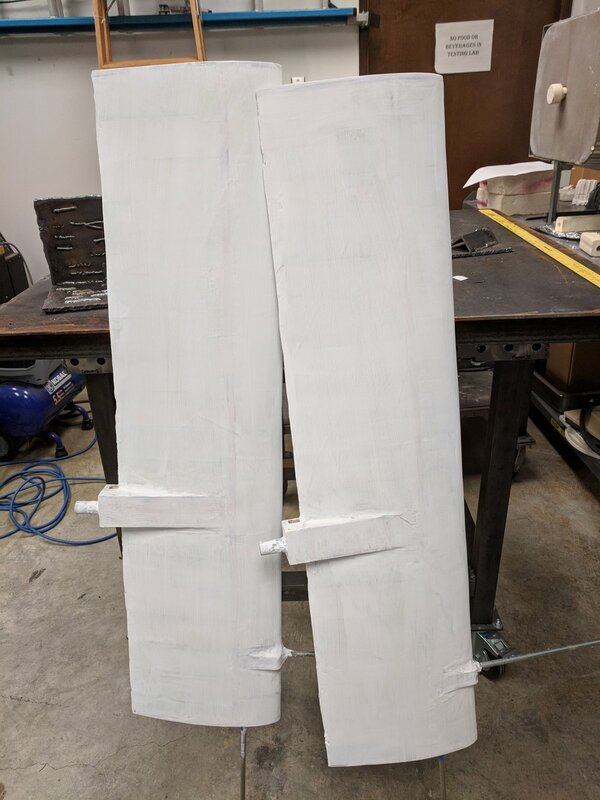 Most of this summer's progress has been in the software realm -- we've spec'd out and written most of the necessary modules for the Microtransat boat. We're adding them in to the little boat's control system one at a time to test how they work in practice, and sailing them in Lake Washington when our schedules and good wind line up. Since the boat is a bit on the heavy side, it's not a particularly good sailor and really needs about 10 knots of wind before it performs decently. That's good enough for software testing, however. We're looking forward to additional sail testing this afternoon, and we're also exploring resurrecting TSV Disputed Right of Way for creating a database of tagged images of the marine environment around Puget Sound. Last fall, we successfully tested our wing schooner sailing system on a one meter scale in Seattle's Greenlake. This test (on a tether) has given us the confidence in the basic soundness of our concept to proceed with the design and construction of our Microtransat Challenge boat. This boat will be the maximum length (2.4m) with a displacement of approximately 75 kg, about half of which will be ballast. The wingsail/masts are similar in concept to our wingschooner demonstrator, but the bearings are set into the sail rather than the hull in order to have water drain away from the bearings rather than pooling on top of them. First, the slight change of plans. We've decided to compete in the Microtransat Challenge in preparation for circumnavigation. Since Microtransat boats are limited to 2.4m (8 ft) and the task is crossing the North Atlantic rather than circumnavigation, the team determined that we could build a competitive boat without having to raise outside money. The Microtransat has run every year since 2010, but is sufficiently challenging that no team has yet completed either the east bound or the west bound race. The rules are relatively simple -- vessels may be up to 2.4m long, must be self-guided with enough precision to hit a pre-selected point on the finish line, and must be propelled by the wind. Our wing schooner demonstrator afloat in Greenlake. Currently, we're working on building the wings and completing the software. More to come on those subjects and the design process for this boat in future installments, which should hopefully come at less extreme intervals. We put larger (and lighter) tails on the wings as well as a proper windvane and got back in the water on Oct 22, again at Greenlake. We got the boat to reach, run, and even sail to windward under some measure of steering control. We still have the leash on it because the control is still dodgy, and the range is not wonderful. The weather has conclusively turned here in Seattle (it snowed both today and Friday), so we're going to spend our time working on software and planning for the around the world boat and our fundraiser to pay for it. There was more wind than predicted this afternoon, so we had the opportunity to get the sail boat in the water for our first successful sailing test! The boat sailed under its own power, responded to remote commands, and we successfully retrieved it. However, it's going to take a lot more practice and some modification to get good, predictable control of the boat. There are a couple of reasons for this. First, it's just a plain hard boat to steer. The steering response is quite different from any other boat. Second, the wings have too much inertia relative to the size of the tails, which makes them hard to control in relatively light and changeable winds like we had today. Our next steps will be printing some bigger tails (moar powah!) and moving up our plans for a third wing revision. In other news, we're looking at MOOS-IvP for building the next software generation, and it looks good. Welcome to our new blog! This will be the central source for longer form news and discussion about the Ladon Project in the future. You can also follow us on Twitter (@ladonproject) and on Facebook. If you want some more technical detail, you can check out our Hackaday.io project page.